Immaculate coach Nelson Mingachos during the SWC boys basketball game between Newtown and Immaculate in Danbury, Jan. 28, 2019. 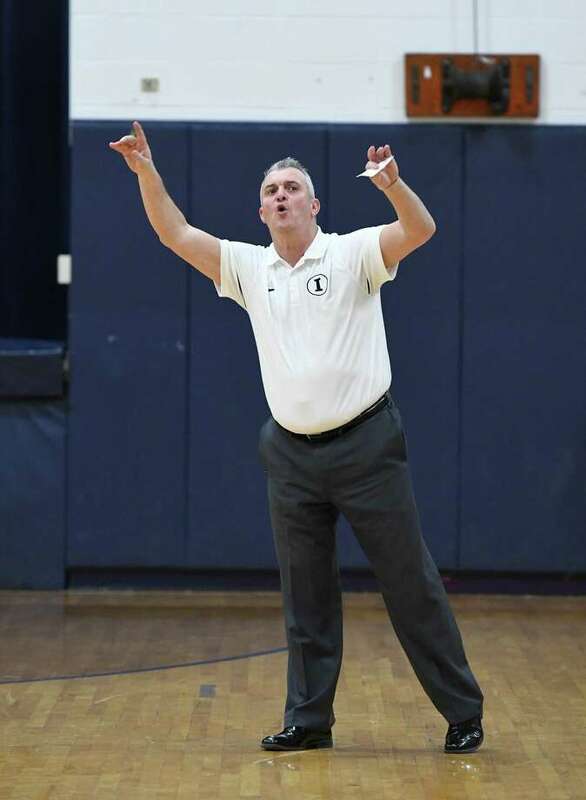 Immaculate boys basketball coach Nelson Mingachos earned his 200th career win as his Mustangs rolled past Brookfield 60-40. Mike Basile (19) and Quinn Guth (18) combined to score 37 points to deliver Mingachos the win. Mingachos began coaching the program in 2005, replacing veteran coach Bob Nelson. In that time he has claimed a trio of state championships (2012, 2016, 2018) and an SWC title (2012). The Mustangs are right in the championship hunt again. Immaculate improved to 15-3 and 11-0 in the SWC with just two regular- season games remaining. Next up a big one, though, as the top seed in the league will be on the line Thursday when Stratford visits. The score was knotted 22-22 at the half against the Bobcats before shots began to fall for the hosts. Sean Guiry added 13 for Immaculate.